This is a delicious yet simple Paleo dessert that will be ready in no time and doesn’t require too much preparation. It’s important to choose fresh ingredients for this recipe if you want to get the most out of it when it comes to taste and nutrition. 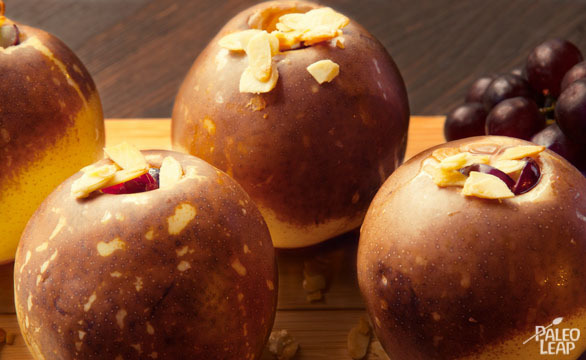 Similar and a great alternative to the baked apple recipe, it’s a rather sweet dessert, but it’s still a healthy indulgence. They are always a hit when served in my household. I even often find myself enjoying one of these pears with a poached egg for a quick and simple Paleo breakfast. I really like the moist and soft texture of the grapes and pears combined with the crunchy texture of the almonds. Add to that the fact that they are enjoyed when really warm and right out of the oven and you’re in for something that might even get a bit addictive. This time around I chose Asian pears to prepare this recipe. They are also known as the Korean pear, Japanese pear or Apple pear. I love the taste of that kind of pear as it stands out from most other kinds. Since these pears are not always available, I often try to get the most out of them when they are. Of course, you can always use other kinds of pears for this recipe. Just keep in mind that the Asian ones have the shape of an apple and are therefore often larger than most other pears so you might have to adjust the cooking time when using a different option. I did add some sugar in this recipe in the form of raw honey, but again, listen to your body, if you feel better without it, don’t add any. If you can’t properly control your sugar cravings, that recipe might not be the best option for now. Give yourself some time to adapt to a diet with much less sugar before indulging too much in the sweeter options. This recipe as well as most other dessert recipes available here are better to keep for special occasions or when you really need to satisfy a sweet tooth. Some sugar can be perfectly healthy, but too much fructose can easily creep in and become unhealthy. If you do decide to use some honey for the recipe, go with a raw honey, which is a much better option than regular pasteurized honey. Other than being much more delicious, raw honey contains additional enzymes and minerals. It should be available in most health food stores and isn’t usually that much more expensive than pasteurized honey. You’ll even often have the chance to choose between honey produced from different flowers. In a bowl, mix the sliced almonds with 1 tbsp of the honey. Take a cooking plate and put a parchment paper to prevent the ingredients from sticking and place the almonds mixture on it. Place in the oven and cook for 15-20 minutes, until they are brown and crisp. While the almonds are cooking, take the Asian pears and core them from the top, being careful not to go all the way through and to leave the bottom on the pears. Place the four pears on a cooking plate. Take the red grapes and cut them all in into small pieces. Place in a bowl. Once the almonds are ready, mix the grapes with the almond mixture and then fill the pears with the mixture from the top hole. 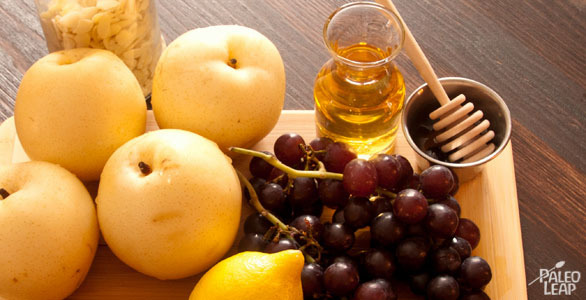 In a bowl, mix the apple juice, the lemon juice and the remaining 1 tbsp honey. Drop the mixture in the middle of the top hole as well as all around each pear. Place in the oven and let it cook for 25 to 30 min.